Having the latest technology at your fingertips doesn’t have to mean weighing down your suitcase. We’ve found seven can’t-be-without tiny travel gadgets you never knew existed (until now), and best of all, they’re all pocket-sized. Charge your iPhone and your Kindle using the same device? We never thought it was possible until we saw the Ultra Portable Pocket Charger, a magical device that has built-in Apple Lightning and Micro USB cables. It’s small enough to fit in your back pocket, while still packing enough power to give your phone about 2 full charges. If you’ve got the sun and the Dizaul Solar Charger, then you’ve got power. This solar charger can give your phone a full charge or up to 150 hours of light (on the flashlight setting). It’s about the same size as your smartphone. And you can feel good about this purchase—for every WakaWaka sold, a solar light will be given to someone living without electricity. Tired of shaky smartphone videos or photos? The Kenu Stance, available for iPhones and Android or Windows, fixes your problem (and photos). It’s a tripod that mounts right into your phone’s charging point—and it only weighs 1.2 ounces and folds down smaller than a pack of gum. Finally, a TSA-friendly multi-use tool that you can actually take on airplanes. The Victorinox Jetsetter packs tweezers, toothpick, scissors, key ring, screwdriver tip, bottle opener, and wire stripper into one tiny tool. Is your electric razor taking up too much space in your toiletries bag? Get the NPET Travel Razor, which is smaller than your phone, and can be charged through its built-in USB connector—no annoying cords or bulky batteries required. 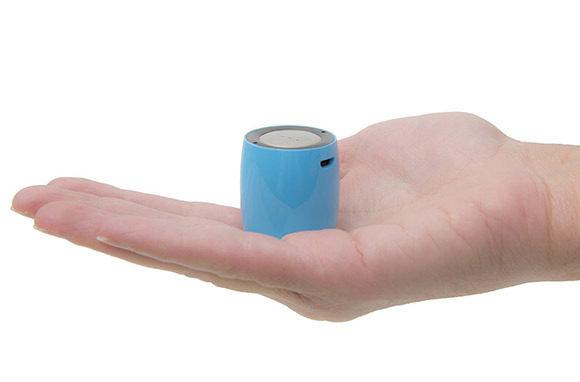 The Ancord is by far the smallest wireless speaker we’ve ever seen. It’s about the same width as a quarter, and only weighs 1.51 ounces. Charge its battery via the built in USB connection and you’ll get around four to six hours of use out of it. If you’re headed out on a road trip, the BlueDriver diagnostic scan tool could save your vacation if your car quits on you. This tiny tool works with your smartphone and lets you diagnose problems with your car (wireless, and no mechanic required). You can read and clear diagnostic trouble codes all on your own via Bluetooth, which will save you time and money for minor problems.